Metropolis is a stunning purpose built space with the ability to cater for a variety of corporate or special events. This unique venue exudes luxury, style and sophistication from the moment your guests enter the space. Fitted with Mark Douglass Design pendant lights, two brass bars, marble features, premium mirror finishes, and complemented by contemporary furnishings and occasional pieces, this chic and stylish space is sure to take your event to the next level.Featuring a 17 metre internal dome ceiling and 9 metre high windows which boast ample natural light and the city’s most impressive views, your guests will be in absolute awe of the the space. The versatile venue design includes two separate entrances, inbuilt motorised drapes and an operable wall which allow complete flexibility when planning conferences, meetings, AGM’s, gala dinners, cocktail events, and product launches. 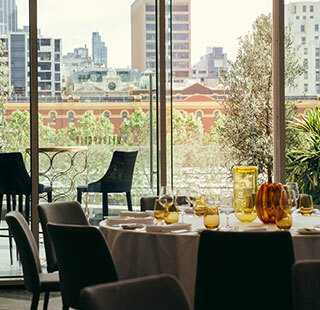 Located within walking distance of public transport, public car parking directly below, and neighbouring accommodation including the Langham Melbourne and Quay West Suites, Metropolis Events offers a fresh and modern approach to corporate entertaining and conferencing. To make an enquiry or arrange a site inspection of Metropolis Events, please contact our sales team.